E-Governance has become an essential part of any firm in globalisation process. Increasing demands of clearness in administration, rapid information transfer, more competent performance and improved public service has pushed organizations to choose electronic means for success in business. Organizations can give better performance through innovative use of information technology and e-governance. There are many advantages of e-governance and impact public management through, for example, improved access to services, decreased operational costs, enhanced knowledge management, and strengthened coordination of government agencies. E-government has been major developments of the web. It is well established that Internet supported digital communities, they present the national governments with a number of challenges and opportunities. The application of ICT and e-governance has huge potential for intermediate organizations in developing countries. The main goal of e-governance is to support and simplify governance for all parties' government, citizens and businesses. E-governance uses electronic medium to support and motivate good governance. Therefore the purpose of e-governance are analogous to the objectives of good governance. Good governance can be seen as an application of economic, political, and administrative authority to smoothly manage business activities of a country at, national and local level. E-governance is the good usage of information and communication technologies to transform and enhance the efficiency, effectiveness, transparency and accountability of informational and transactional exchanges with in government, between government agencies at National, State, Municipal & Local levels, citizen & businesses, and to authorise citizens through access and use of information. 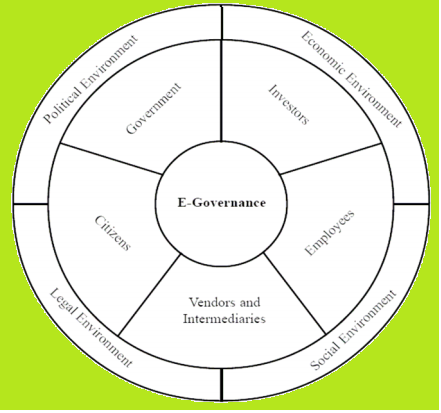 Fundamentally, E-governance, entails electronic governance which uses information and communication technologies at various levels of the government and the public sector to improve governance (Bedi, Singh and Srivastava, 2001). Theoretical studies demonstrated that E-Governance is the process of change of the relationship of government with its constituents the citizens, the businesses and between its own organs, through the use of tools of information and communication technology. Keohane and Nye (2000) asserted that "Governance implies the processes and institutions, both formal and informal that guide and restrain the collective activities of a group. Government is the subset that acts with authority and creates formal obligations. Governance need not necessarily be conducted exclusively by governments. Private firms, associations of firms, nongovernmental organizations (NGOs), and associations of NGOs all engage in it, often in association with governmental bodies, to create governance and sometimes without governmental authority." The objective of e governance is to embrace information and communication technologies and offer an opportunity to citizens, so they can get involve in decision making process. According to The UNESCO, E-governance is the public sector's use of information and communication technologies in order to enhance information and service delivery, motivating inhabitant involvement in the decision-making process and making government more accountable, transparent and effective. E-governance involves new styles of management, novel ways to decide policy and investment, new ways of accessing education, and listening to citizens and new ways of organizing and delivering information and services. The purpose is to give better access, accountability and efficiency in the delivery of government information and services. E-Governance has capability to provide all government information and services on internet to the public and private sector. An e-governance initiatives and innovations will ensure a more democratic, transparent and accountable framework for the public and private apparatus to operate in. The governments of developing countries must establish a suitable environment for e-governance. E-governance is the method of service delivery and information dissemination to citizens using electronic means providing many benefits over the conventional system (Jayaradha and Shanthakumar, 2003). These include increased efficiency in various Governmental processes, transparency and anticorruption in all transactions, empowerment of citizens and encouragement of their participation in governance. Ray and Dash (2015) considered that e-governance should also include the aspects of internal working which cover use of information technology to increase competence and effectiveness of internal functions and internal communications and internetworking. Internal aspects cover the overall change of government hierarchy to adjust to the new requirements and expectations of efficient and improved services, simplification and rationalization in the business process to better serve the stake-holders in a transparent and cost-effective manner. With the technical development of internet technology in the nineties, there was global shifts towards increased deployment of IT by governments. The technology as well as e-governance initiatives emerged a long way since that time. World Wide Web offered good opportunities to global population to exploit their new mode of access in wide ranging ways. People have great expectation to get information and services online from governments and corporate organizations to further their civic, professional and personal lives, thus creating plentiful evidence that the new "e-citizenship" is taking hold. In India, the notion of e-governance during the seventies with a focus on development of in-house government applications in the areas of defence, economic monitoring, planning and the deployment of IT to manage data intensive functions related to elections, census, and tax administration. The National Informatics Center made great efforts to link all the district headquarters in the decade of eighties. Since the beginning of nineties, IT technologies were enhanced by information and communication technology to expand its use for wider sectorial applications with policy emphasis on reaching out to rural areas and taking in greater participations from NGOs and private sectors. The e-governance model can serve as a reference for governments to situation where a project fits in the overall development of an e-governance strategy. An e-governance strategy is essential to accomplish the corporate goals. Projects have structural value for development when entrenched in vision and supported by policies. Anderson had described the process of implementing e governance projects. He has perception of Think big, start small, and scale fast. To understand deeply about the e-governance space, researcher developed four different frameworks and models. 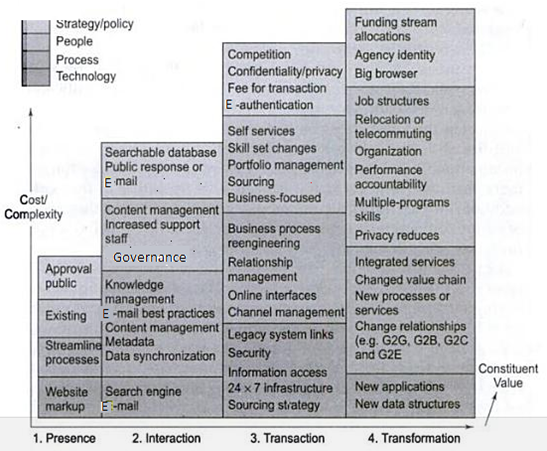 Gartner proposed a four-stage model for e-governance. In the first stage of "Presence", governments will go to the Internet and establish a least presence online. In the second stage of "Interaction", online presence will be reorganised and enhanced to include a searchable database of services and government staff will begin to interact with communication tools such as E-mail. In the third stage of "Transaction", governments will provide services online. At this stage, inhabitants will be able to benefit government services and governments can use E-authentication and payment services for providing services. The Fourth stage of Gartner's model is called "Transformation" in which governments will begin to assimilate services across various levels and functions to provide integrated services from various departments. Gartner believes that pace layers can be used to develop a business application strategy that delivers a faster response and a better ROI, without sacrificing integration, integrity and/or governance. Another e governance model is developed by Layne & Lee and they argued that e-governance is an evolutionary phenomenon and e-governance initiative should be started and implemented in an evolutionary way. According to their model, the initial stage is cataloguing in which governments will provide information online, in the second stage of e-governance projects, government moves to transaction. E-Governance tools will start revolutionizing governments by changing the way they interact with their peoples. In the third stage of "Vertical integration" theorists asserted that e-governance projects will move from mere automation and digitization of the existing process to transformation of government services. 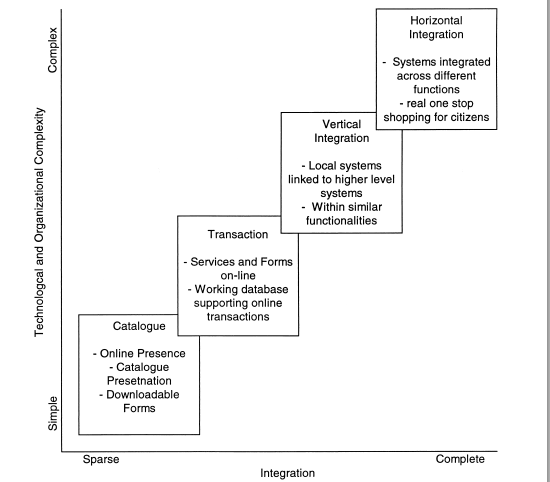 The last stage in the model of Layne and Lee is horizontal integration in which Information Technology tools will horizontally integrate services across different functions of government. The United Nations Organisation provided a five-stage model of E-governance in 2003 after conducting survey. 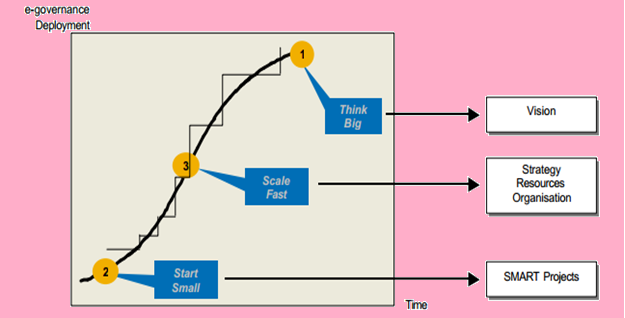 In this model, first two stages are similar to the Gartner's model. In the first stage of this model, there is limited, basic and static information through an official website or a portal. The second stage offer searchable databases and information related to laws and regulations. The third stage is recognized as "Interactive presence" in which government services will enter an interactive mode with electronic signature facilities and multimedia capability. In the Fourth "Transactional Presence" stage, government services will be offered as online transactions. Inhabitants will avail and pay for services using government portals. In the last stage of the UN's model, "Networked presence", Government agencies will be combined to offer integrated services from various departments. 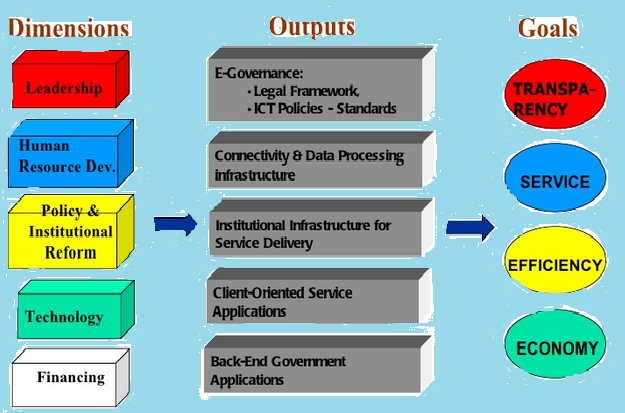 Another model suggested by Finger and Pecoud for e-governance based on three different policy levels which include local, national and global, three different sectors involved such as private sector, government and third sector, three different policy functions that are policy making, regulation and operations and three different degrees of making use of New Information and Communication Technologies. India is a country of diverse culture, tradition, language, geography and the monetary condition of the people. In this country, there are number of people who are below the minimal socioeconomic benchmarks. This includes rural and urban poor, women in rural areas, street children, people of disadvantaged castes and people living in less developed areas. The susceptibility of these sections of society has increased with globalization and this section is prone to become even more marginalized, economically and socially. According to scholars, India is a developing country with great potential for a speedy development. However, it has undergone the impact of political crisis. These events severely affected India's growth as well as they have pushed India back by many years. E-Governance/ICT initiatives has immense role in the enhancement of improving accessibility, cutting down costs, lessening corruption, extending help and increased access to un-served groups in India. In the age of technical advancement, e-government initiatives have reached most of the people belonging to these sections of society. Improved access to information and services has offered economic and social development opportunities, enabled participation and communication in policy and decision-making processes and empowerment of the feeblest groups of society. This has promoted ownership and building of social capital, which in turn, constitute a basis for local revival. India has good position in implementing ICT in the Asia. India is linked with most of the nations of the world. With the adoption of E governance formation and communication technology, India's tourism is enhanced. Furthermore, the steady changes taking place in the telecommunications industry in India which positively impact in fiscal growth of country and provide better services and lower prices for customers. In India, government is also providing investment incentives in terms of tax concessions and establishment of e-zones for ICT-based industries. There are agencies such as India National ICT Council and projects such as e-government initiatives which are accountable for spearheading, devising and implementing of E governance. The successive establishment of the National Informatics Centre (NIC) in 1976 with the financial help of the United Nations Development Program (UNDP) was major step to execute e-Governance in India. After that numerous e-Governance initiatives launched at both national and state levels. These projects implemented to make progress to address major problems related to government service. On the basis of the advice of the Second Administrative Reforms Commission, the Government of India devised a National e-Governance Plan (NeGP) in 2003. The NeGP was initiated with a vision of "Make all Government services accessible to the common man in his area, through a common service delivery channel and guarantee efficiency, transparency and reliability of such services at reasonable costs to meet the basic needs of the common people (NeGP, 2003). Afterwards array of projects were implemented. Reviewing the academic studies, it has been found that there a hot debate related to e-governance as it does not provide a clear agreement on the requirement to have bureaucratic system change with the use of ICT. Many theorists stated that e-Governance led revolution has good impact on government organisations because they aid to achieve better governance by lessening cost, better dissemination of information, supporting better involvement and interaction and efficient delivery of services (Jaeger, 2003). Other group of researchers argued about the importance of transforming the existing model of government bureaucracy (Kallinikos, 2004). Some researchers raise concern about the impact of information and communication technology applications and bring changes to government processes (Ciborra, 2015). Studies have shown that E governance has potential to bring vivid changes or transform government institutions rather than automate or reform organisational structures (Ho, 2002). There are many obstacles to execute E-governance policies. These include insufficiency of funds, infrastructural problems, scarce manpower, citizen enthusiasm, data accumulation, legal framework readiness, and maintenance (Jayaradha and Shanthakumar, 2003). According to a NASSCOM report, e-Governance in India is considered as a rapidly growing section with three southern states namely Andhra Pradesh, Karnataka, and Tamil Nadu which made significant progress. Experts recommend that in order to get desired benefits, government must have to take several pro-active steps to address the operational, economic, personnel, planning and implementation issues, which are the hold-ups to effective application of e-Governance (Rao, 2003). Advanced technologies requires novel way of thinking about service and business process design, new ways of working, the development of new skills, the use of old skills more effectively and a more flexible approach to working patterns and practices. Robbins (1998) asserted that structural inertia (built-in mechanisms) is major obstacle for transformation process in industries. Another inhibition is people's resistance to any change. It is important to design such employee-oriented Human Resource strategies as would allow the organisation to prepare employees for change and also support them to absorb rather than adsorb the changed systems. There are also cultural obstacles which refer to values, beliefs, mind-set, practices and customs of people. These hindrances have major challenge to install new system. Cultural barriers exist at employee level, officers' level and political level (Sharma and Palvia, 2004). Changing from being an organisation to become 'e-organisation' greatly impact organisation structure and management styles as it results into re-distribution of power and control. It also changes the alignment of the organisation. Companies adopting e governance must develop customer orientation which understand the requirements of the user, explore new ways of presenting information to meet customer needs; design feedback mechanisms; manage customer relationships; streamline processes; develop good communication process, organise information, work more flexibly; make better decisions, coordinate activities, focus on major issues in the context of personnel which include doing job analysis again to redefine job responsibilities and other job dimensions of various jobs affected by the change. Organizations also concentrates on redesigning the recruitment and selection process according to changing manpower needs, the identification of competencies of technological environment to facilitate all employees to operate efficiently in a fully electronic working environment, developing a performance management program that would integrate changes in job responsibilities and requirements and which is development oriented, educating employees about their new legal and corporate responsibilities and obligations, developing knowledge workforces capable of multi-tasking (Riley 2003). Companies must evolve an environment that would encourage any positive behaviour exhibited by employees, focus on better management of efforts between various government agencies as it will affect program effectiveness and efficiency. additionally, effective implementation requires changes in decision making processes, involving quicker decision mechanisms, changes in organisation structure making it flatter and higher delegation of authority (Garg and Khataokar, 2003). It is essential to incorporate the new vision with the structure, culture and strategies of the organisation. There is a need of appropriate strategies of e governance and information and communication strategies to bring changes in various internal systems of organizations for issues. It has been found in many studies that a highly motivated and satisfied workforce give better performance than a demoralized and dissatisfied workforce (Prasad). There are some strategies to tackle problems in various areas of human resource management in the changed environment. On the basis of the new profile of employees required for e-governance, new sources of their availability need to be tapped. One of these sources could be college campuses, a source which has been well utilized by private organisations. Feasibility of other sources like HR consultancies, may also be explored. The existing manpower may not be ready to be deployed into e-governance projects. Training costs might be high due to geographical spread. Designing a selection process that would objectively and correctly measure the skills and competences required to handle the changed work style and job responsibilities is required. Such a process should incorporate methods that would objectively assess the knowledge and skills required to handle the redesigned job. The e-governance implementation leader should have strong conceptual and management skills. The leader must be responsible for guidance as well as act as mentor and coach. Leaders need to change their styles and will have to adopt different approaches to manage people in new work settings in the organizations that are characterized by use of current technologies, and continuous change. To summarize, E-commerce is the exchange of information across electronic networks, at any stage in the supply chain, whether within an organisation, between businesses, between businesses and consumers, or between the public and private sector. E-Governance denotes to the public sector's use of Information and Communication Technologies in order to improve information and service delivery, encouraging inhabitant participation in the decision-making process and making government more accountable, transparent and effective e-governance has different meaning in the developing world. Aim of achieving e-governance and changing India's economy goes far beyond mere computerization of separate back office operations. It means to vitally change as to how the government operates, and this implies a new set of responsibilities for the executive and politicians. It will need basic change in work culture and goal orientation, and concurrent change in the existing processes. The change in the mind-set to develop and agree the distributed and flat structured e-governance system is needed at higher level system to make good position in world.